The article “Plan Now or Pay Later: Sustainable Design Ideas for Digital Asset Management” co-authored by Modula4 CTO Michael Gellner and David Diamond, author of The DAM Survival Guide is featured in the latest edition of the Journal of Digital Media Management. Appearing as the lead article in Volume 7, No. 1 (Autumn, 2018) of the journal, “Plan Now or Pay Later” provides guidance to organizations when determining which processes to automate in their DAM system to get the biggest return in time and cost savings. This allows them to maximize the usability of their DAM systems by removing repetitive manual task without making the them needlessly rigid. The Journal of Digital Media Management is the major peer-reviewed, professional journal for anyone involved in the capture, storage and effective application of digital media assets. Copies of the article can be downloaded here. Check out the the new “explainer” video for Veriflies. In about a minute you’ll see how Veriflies helps global brands manage image requests and approvals. This “digital asset compliance” tool ensures that only approved assets, with approved metadata, goes into you DAM system. Use Veriflies to keep “junk” asset out of your DAM, ensure that all assets are legally compliant (i.e. tagged with usage rights), and meet your technical specifications. To view this brief video, visit out Veriflies page. Modula4 has introduced AI Auto-Tagging, a new feature of the DAM4 Platform. Using Artificial Intelligence (AI), auto-tagging analyzes images to suggest metadata tags. Tags are based on what appears in the image as well as what’s inferred from the context. It also identifies the dominant colors. AI Auto-Tagging is powered by Clarifai, the leading AI image tagging service. Clarifai offers a free tier of service, with packages available for high-volume tagging. Clarifai uses their advanced machine learning system to evaluate millions upon millions of image to build its ever-expanding reference base. AI Auto-Tagging is also available in a Custom Edition which lets you use your own images to train the image recognition and tagging. This fine-tunes the image analysis and tags to the specific needs of your organization. You can learn more about AI Auto-Tagging here or by contacting Modula4. Modula4 has announced that their popular Cumulus asset ordering system Email Order System Pro (EOSP) is now available for the Portals web interface. Originally available as an option for Modula4’s Web Module and Canto Sites, the Portals version retains the ease-of-use and functionality of the versions previously only available for the other Cumulus interfaces. 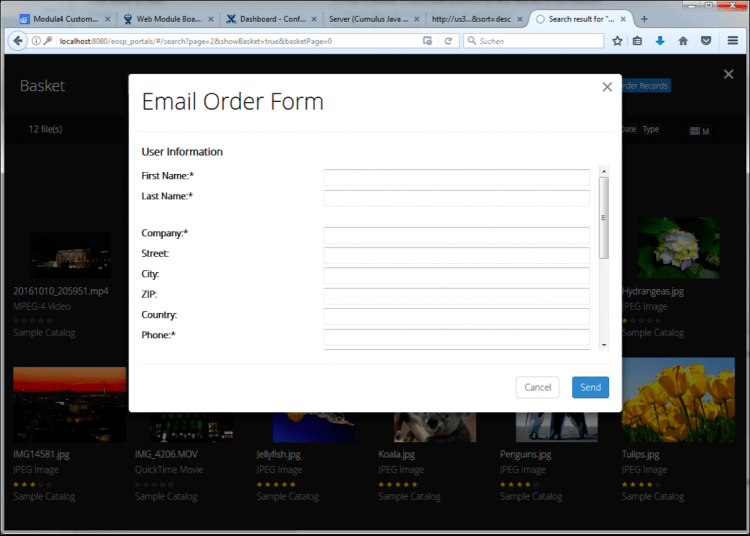 With EOSP users simply fill out a form to have assets delivered to them via email. The flexible forms are easy to create. An intuitive admin interface makes it simple to set-up and manage. EOSP offers multilingual support and includes an extension that lets administrators find the requested assets using the Cumulus admin client. Learn more by visiting the EOSP product page or contact Modula4 to request a demo. Juan joins us from Canto where he has worked since 1998, minus a few years elsewhere. At Canto he helped clients get the right system, and stay happy with it over the long-term. As an independent consultant Steffi has used her UI/UX and design experience to help clients such as Sony, the World Wildlife Fund, T-Systems, McCann-Erickson, and . . . Modula4!. Now as a staff member of Modula4, Steffi will help ensure that the user experience of our products and customizations are second to none. Learn more about Juan, Steffi and rest of the Modula4 team. Modula4 CTO Michael Gellner will be leading a session titled “Beyond Configuration: Custom Solution Success Stories” at the Canto DAM Summit Americas. The conference is being held in New York City on May 9 & 10. In this session Michael will show how Cumulus can be tailored to address your organization’s exact needs, and he’ll present examples of solutions Modula4 has created for their clients. Modula4 CEO Jon Hornstein will be joining Michael at the event. Attendees can schedule a time to meet with the Modula4 executive team using this form. Modula4 is participating in the Canto DAM Summit Americas as a Gold Sponsor. The conference, which is being held in New York City May 9 & 10, is focused on delivering Cumulus customers and digital asset management experts insightful case study presentations and workshop discussions. The Modula4 executive team of CEO Jon Hornstein and CTO Michael Gellner will be attending. At the event they will host a breakout session titled “Beyond Configuration: Custom Solution Success Stories.” In this session they will show how Cumulus can be tailored to address your organization’s exact needs and present examples of solutions Modula4 has created for their clients. Attendees can schedule a time to meet with the Modula4 executive team using this form.